When you've hit a roadblock, can't get a response, or just want to give up we've got a great group of volunteers who can help. Like Theodore in Phoenix who says he shipped a shotgun and a rifle. But only the shotgun arrived. The package was insured for $1,000 but he says the company is "constantly changing requirements" for "people to file a claim"
So he let me know. And ABC15/Better Business Bureau volunteer Sandra took on the case. She connected with the shipping company and convinced them to work with Theodore for resolution. Not even two weeks later they settled for $700. Ever received an outrageous medical that you know you shouldn't owe? So did Michelle in Sun City. She says her faith-based health share plan denied an emergency room visit 3 times. With the bills headed to collections, she let me know. ABC15/BBB volunteer Ethel went around the health share plan and headed straight to the hospital. She was able to explain why Michelle thought she was covered. It took a couple of months but the hospital slashed nearly $20,000 from the bill. After spending more than $1,400 plane tickets to Florida Miranda in Glendale had to cancel due an injury. The airline gave her a voucher. She'd tried to use it but says it was only worth half of what she paid. She couldn't get anywhere so she let me know. 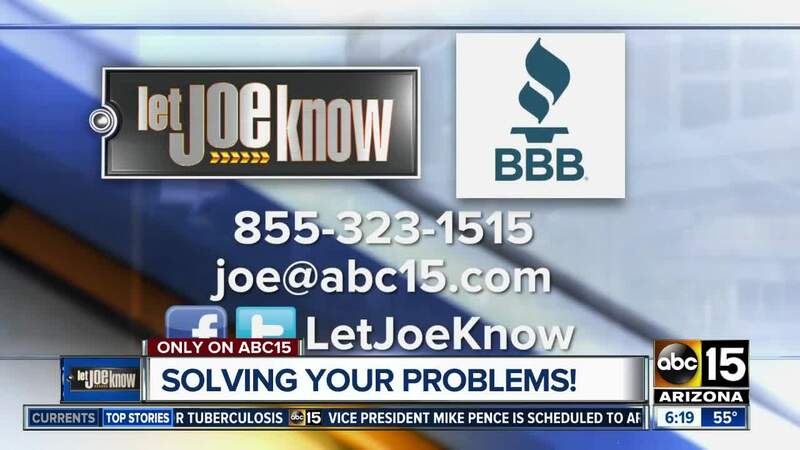 And ABC15/BBB volunteer George flew into action, and got results. Miranda say within weeks the airline apologized and "offered to refund our tickets in full including the fees." And reminded her: "There are good people out there volunteering their time to help others."